I had a wonderful opening reception. Thank you for coming! If you could not attend, the exh. runs this summer till Sept.14. Weekdays: 9-4:30, weekends by appointment, 773-371-5416 The Mary-Frances and Bill Veeck Gallery (Catholic Theological Union) The address is 5416 S. Cornell in Hyde Park. If you take Lake Shore Drive south, get off at the 53rd St. exit. Go 2 blocks west to Cornell and turn south (left). The Catholic Theological Union is about 2 blocks south on the right side of the street. Parking is available in the CTU garage which is attached to the building. The entrance is just south of the main door. Free. The pictures: Artist Talk, with Lindsay Obermeyer (her beads piece is truly stunning!, and cutator Jannis Pozzi-Johnson. Jennifer Weiler showing her finished pieces. Julia during crit. Jess is painting. Madder and Cochineal on rice paste. 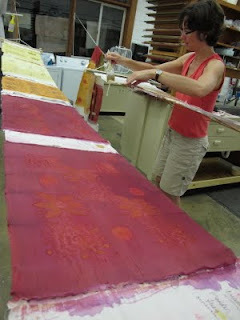 Dietta Hitchcock's pieces, Cutch with iron mordant.